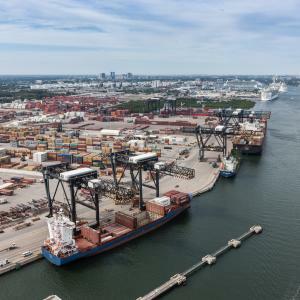 BROWARD COUNTY, FL - Crowley Liner Services has entered into a new 10-year, $157.8 million lease and operating agreement with the Broward County Board of County Commissioners for a 99-acre marine terminal at Port Everglades. The agreement also includes two five-year extension options. The lease agreement combines Crowley&apos;s original 74-acre leasehold with the 25-acre SeaFreight leasehold, which Crowley acquired in October 2015. "Crowley became the first tenant in our Southport container terminal complex in January 1990, and has grown, and restructured, the terminal from its original 55.54 acres to become our largest marine terminal operator. We value our long-term partnership with Crowley Liner Services and appreciate the company&apos;s flexibility as Port Everglades continues to expand for future growth," said Port Everglades Chief Executive & Port Director Steven Cernak. In Fiscal Year 2015 (October 1, 2014 through September 30, 2015), Crowley transported 145,940 containers through the Port, generating nearly 29 percent of the Port&apos;s total container revenue. During the same time period, SeaFreight moved 41,801 containers. This business activity will also support 1,995 indirect and induced local jobs. These estimated impacts are based on the Port Everglades Economic Impact Model previously developed and recently updated by Martin Associates for Port Everglades. At the crossroads of north-south and east-west trade, Broward County&apos;s Port Everglades serves as a gateway to Latin America, the Caribbean, Europe and Asia. Located within the cities of Fort Lauderdale, Hollywood, and Dania Beach, Florida, Port Everglades is in the heart of one of the world&apos;s largest consumer regions, including a constant flow of approximately 110 million visitors statewide and 6 million residents within an 80-mile radius. Port Everglades has direct access to the interstate highway system and the Florida East Coast Railway&apos;s 43-acre intermodal container transfer facility, and is closer to the Atlantic Shipping Lanes than any other Southeastern U.S. port. Ongoing capital improvements and expansion ensure that Port Everglades continues to handle future growth in container traffic. A world-class cargo handling facility, Port Everglades serves as an ideal point of entry and departure for products shipped around the world.